Massive Muscle Gains: Want 12lbs Of Muscle This Year? “Are you getting fat when “bulking”? It certainly isn’t because of a lack of cardio. It’s because you’re eating too much. The often recommended 500 surplus calories per day is quite ridiculous. “See here for an estimate how many calories you really need. Use this as a starting point and adjust if necessary. Let me prove this, lest you think I’m mistaken. We’d all agree that if an intermediate lifter gained 12 pounds of muscle this year, that would be a fantastic achievement! 12 pounds of lean muscle on your frame would make a MASSIVE, noticeable difference, especially if you’ve been into this game for a few years. Now, how much do you think the scales would increase per week for this awesome transformation to take place? 12 / 52 = 0.23lbs – that’s less than a quarter of 1 pound per week. So this astounding bodybuilding success is gained with an increase in body weight of just 1/4lb per week. That’s all. 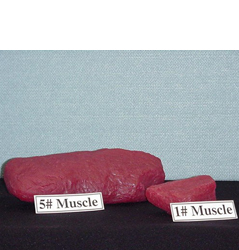 A pound of muscle is about 600 calories (compared to 3500 for a pound of fat). This is because muscle is mostly water, not protein as the bodybuilding establishment would have you believe. A quarter pound is then 150 calories per week, which equates to around 38g of new protein for the body to synthesize per week. This comes to 21.5 calories per day, which is about 5g protein/day to be synthesized. How absurd it is to recommend 500 surplus calories every single day! Many unenlightened bodybuilders get so frustrated if they’re not gaining 1 or 2 lbs of scale weight per week. Of course it’s not long before they become another lifter with a massive gut; another bodybuilder who’ll NEVER attain the type of body they set out to create when they first got into this game. A habit that is particularly destructive is taking a daily bodyweight reading. This can only end in tears, my friend. It’s virtually impossible to see changes in body weight due to gains in lean mass on a daily basis. Yet there are people out there who reinforce this form of discouragement every single day. Furthermore, there are so many fluctuations in body weight that it’s perfectly normal to get a decrease in weight from one day to the next, or even one week to the next. If you gained a 1/4 lb of muscle next week, but had less water weight, or less umm….waste product….,you’d probably weigh less. STOP WEIGHING YOURSELF DAILY OR WEEKLY. NOTE: Cutting is a different matter. Weekly readings are advised in Total Six Pack Abs, but daily readings are still a no-no. Focus on your workouts and your strength progressions. The cross section of a muscle is directly proportional to its strength. So give all your attention to your THT workouts. It’s all about those progressions! If you’re progressing, you’re going in the right direction. If you really want to take body weight readings, once a month is plenty. One phenomenon that has been noted by many including myself, is that increases in muscle size are cyclical for many people. What I mean by this is that many people continually make strength increases for a period of time with little increases in size. Then a few months later, they seem to start PACKING on new slabs of muscle in a rather short period of time. They then maintain this new size while making further strength increases for another period of time. 2-3 months later – Blam! Another slab of meat! It’s just the way it is for some people. By the way, what about those first participants on the Arms Blast Experiment. Gaining 1/2 to 7/8ths of an inch on their arms over 4-6 days; how much do you think the scales went up with that increase in size? I don’t have that answer, but I bet it barely registered. You have to realize that the bodybuilding industry has an interest in keeping you going through endless bulking and cutting cycles. When bulking, you’ll buy ridiculous amounts of whey protein, weight-gainers, and other supplements that don’t work (like tribulus terrestris). Then you’ll get fed up of that gut and purchase fat burners and meal replacement bars to shift it. Of course you’ll buy bodybuilding catalogues magazines all year round too. The whole industry depends on you NOT figuring this thing out. I get to sport a six-pack all year. Heck, there are people who aren’t even into bodybuilding that are quite muscular and lean all year round. They simply lift and eat whenever they’re hungry. They’ve no idea how many calories they’re consuming. While this isn’t optimal for gains in muscle size, they can have a six-pack year-round because their minds were never poisoned by bodybuilding orthodoxy nonsense. Speaking of the orthodoxy; they tell you to expect 3-5lbs of muscle gain a year. 3lbs a year is 0.05lbs per week, and 0.0082lbs per day. 0.05lbs comes to an extra ~30 Calories per WEEK and about 4-5 Calories per DAY. Yet you supposedly need 500 surplus calories every single day to fuel this minuscule growth!? NOTE: If you’re thinking that you need extra calories to fuel the workouts themselves and the recovery, remember that this is already taken into account in first part of formula before you add any extra/growth calories. Also, the anabolic process itself needs calories/energy, so I’m not advising you to eat 4 extra Calories per day! I’m suggesting you use this formula as a starting point and adjust if necessary i.e. if you add fat, reduce calories. If you don’t measure any gains over a couple of months, add calories. However, I think you’ll find it works out about right. Take Home Message: Devote all your energy to your THT workouts and your progressions. That’s where all the fun is, anyway. At the most, take monthly weight readings. Eat sufficient calories, not excess calories, so you can stay lean and look good all year round. Great article, Mark. Always look forward to your new stuff. I always learn something new, like I never looked at weight gain this way before. Excellent article Mark, as always! Only problem, I have is no ‘Like’ button this time. I’ll check back later and hopefully it’ll be there. Gotta share the wealth. Disappeared on me too, man. It’s back now! Wow thank’s a lot now I know why when I go measure myself everyday since I started the THT 0.2 cycle 4 weeks ago I haven’t gained any pounds lol. so now I will measure every month but oh I lift heavier every week or more reps so I am increasing in strength so that’s good! I have to constantly tip my hat to you here Mark. I’ve told a good group of guys in my gym about your teachings and advice over the past 2years. Some have tried to say “pfft no that’s wrong” etc etc but my progress has been the proof they so needed I guess. With dudes in the gym I see day in, day out, they look pretty good but never improve size or much strength and now where I am, that I’m lifting as much as they are (not as big) they stare at me and ask. I’m not trying to sound like an ego head, just proud of what I’ve been able to accomplish with tweaks following your guidelines. You deserve a ton of props and more recognition and I do my best to spread it around Vancouver. Sorry for the book here but I must reinforce that I so appreciate you and your intentions Mark. Thanks you so much for doing what you do and being a true Mentor. @Mike. They’re automatically generated by google and depends on your cookies what shows to you personally. That’s why you saw an ad for the product you just bought, Mike. P.S. I deleted the product name as I’m not giving free advertising, especially to a product I can’t personally endorse. The fact that muscle contains 600 calories when broken down in no way suggests that it only takes 600 calories over maintenance to build that same pound of muscle. So all of your math is utterly utterly wrong. When you start with a fucked assumption, you end up with fucked up conclusions. I gave up trying to impress people at the gym as well, but they do take notice. I was doing incline benches on a working set and asked a guy for a spot. He was doing about the same weight as me, but sloppy form, bouncing at the bottom. I was doing a 2-1-2 cadence, went to pos. failure and then after ~5 seconds did 2 more forced reps. The guy was actually very interested in why I did it that way and seemed inspired. Who knows. Great article, one of the best I’ve read on here. Seriously, makes sense. I mean, really, bodybuilder type folk ought not eat like the morbidly obese. Why on earth common sense never seems to beat clever marketing I have no idea. when is the new THT cycle coming out? Mark I have a question. If I only take weight readings monthly while bulking how I know my body fat percentage when taking skin fold measurements to find if body fat is going up. Do we then take skin fold and tape measurements also monthly to fall in with body weighing? Hey mark, I have a really high metabolism and im looking to build BIG muscle; if you were in my feet would you prefer a mass gainer or just more calories? Aslo I need a new workout routine would anybody help me out please? Thanks a lot Mark for the informative interaction. Mark, I would be grateful to you if you can let me know the best exercises for chest which can be concentration ones and give the most noticeable results. Looking forward for your reply…. mark, thats great. zipper took the words out of my mouth. Your work and generosity is most appreciated. Can’t wait for the MuscleHack gear though, because it’ll be even easier to send over new guys/girls who see us MuscleHackin’ in the gym and want to know where they can get started too! @Lyle. I agree. I didn’t claim that it takes 600 Calories to ‘build’ 1 pound of muscle, only that 1 pound of muscle contains 600 calories. Later in the post I say, “Also, the anabolic process itself needs calories/energy, so I’m not advising you to eat 4 extra Calories per day! I’m suggesting you use this formula as a starting point and adjust if necessary.” The formula I’m referencing puts people 200-300 cals above maintenance. I then go onto to say, “if you add fat, reduce calories. If you don’t measure any gains over a couple of months, add calories.” This is how I advise people to get bigger while minimizing fat gain. @Mike. I don’t know anything about that supplement, man. Let me know how you get on with it. @Chris. Should be in April sometime. @stickupkid. Yes, a combo of skin fold and tape measurements is a good idea. But even then, you don’t necessarily have to take these weekly if you’re bulking at 200-300 calories above maintenance as recommended. Your choice. @Cody. I would simply start at 200-300 cals above maintenance and adjust as necessary, like I say in the article. Mass Gainers don’t contain anything special that forces muscle growth, they’re just liquid calories. If you haven’t downloaded my free book yet, do that. The workouts are in there. @Yatharth. Just download my free book and work your chest along with all your other body parts. @Jason @Adam many thanks! Looking forward to getting the gear out too, man. Hopefully have some good news next week! Happy St. Patrick’s Day, Mark. Thanks for the info. Glad I found this site last month. Started THT four weeks ago and starting TSPA this week. Mark, on the topic of mass gaining, what’s your opinion on using a sauna post workout to alleviate stress and release toxins? Do you think it could be hindering mass gains even if substantial water intake is met ? Very, very interesting article Mark. I’ve always found a bodybuilding diet to be very expensive but maybe I’m needlessly overeating? “When you start with a fucked assumption, you end up with fucked up conclusions.” Grumpy grumpy Lyle. Funny that you’re the one who started with the fucked up assumption and ended up with the fucked up conclusion. Sorry about your poor reading comprehension skills. So utterly utterly pathetic. relax lyle, you know what stress can do to you muscles..chill out buddy!!! @Sean. No opinion really. If you enjoy it, go for it. But yes, keep your fluid intake up. @Rich. Depends. If you’re gaining fat, you’re overeating. This is why I recommend those monthly readings. You won’t know if you don’t take them. @Bill @Jason. As far as I’m aware, Lyle is an extremely intelligent guy. While making a comment before reading the full text of an article is unfortunate, it happens all the time. No big deal. Had I been making the point he perceived me to have been making, he would have been quite correct.